POSTED March 28, 2018 2:33 p.m.
VERNON AND CRAWFORD COUNTIES - Not surprisingly, with the coming of spring, the farmers of the Tainter Creek Watershed Council are springing into action. At their meeting at the Franklin Town Hall on Monday, March 12, the 13 farmers and supporters gathered to discuss rapidly unfolding plans for education events and award of cover crop installation funds. The group has received a Producer-Led Watershed Grant from the Wisconsin Department of Agriculture, Trade and Consumer Protection (DATCP), which is allowing them to fund their activities this growing season. The next meeting of the group will take place at the Franklin Town Hall in Liberty Pole on Monday, April 23, at 7:30 p.m. The group’s first event will take place on Saturday, June 2 at Bruce Ristow’s farm, 50324 County Road B, in rural Soldiers Grove. The farmers of the Tainter Creek Watershed are proud of the watershed’s excellent quality, which has allowed it to be designated as a Class One trout stream since 2003. The farmers invite the general public to a Celebration of Tainter Creek’s Water Quality. The event is designed to coincide with the DNR’s ‘Free Fishing Day,’ which is a day when no fishing license or trout stamp are required in order to fish. There will be multiple education stations and fishing demonstrations for participants to enjoy, as well as food and beverages. Participants will be able to learn about the fish of Tainter Creek from Wisconsin DNR Fish Biologist Kirk Olson. There will be several fish shocking events, which will allow participants to see all of the different fish that are present in the stretch of water at the event site. Insects from the creek will be discussed by DNR Ecologist Mike Miller and Dr. Jason Freund of UW-La Crosse. Fly and spin rods will be available, and casting lessons will be provided by members the Coulee Region Trout Unlimited and by noted local outdoor author Jay Ford Thurston. There will be casting games and fly-tying for kids as well. The Mississippi Valley Conservancy will be on hand to discuss land protection and restoration efforts across the region, and TUDARE will discuss their work to protect the coldwater watersheds in the Driftless Region, and their plans for work in the summer of 2018 in the Tainter Creek Watershed. Valley Stewardship Network will explain and demonstrate their citizen water monitoring program and techniques. U.S. Fish and Wildlife Service will also provide a rainfall simulator, which demonstrates what happens with soil and runoff during small, moderate and catastrophic rain events. Tainter Creek runs through Ristow’s property, and the Ristows have been longtime participants with Valley Stewardship’s ‘Water Action Volunteer’ program, which conducts water quality sampling in the Driftless Region. Ristow has also been active in supporting the activities of Trout Unlimited Driftless Area Restoration Effort (TUDARE) activities in the watershed. To RSVP for the event, contact Sarah McDowell with the Vernon County Land Conservation Department at 608-637-5480. Josh Engel led the group in a brainstorm of other events the group might offer this season. One idea was to offer an event focused on soil health, bringing in an expert like Ray Archuleta or Jay Fuhrer. There was agreement among group members that the best time for a workshop like this would be in September or October, after cover crops had been planted and had begun to establish. Another idea the group had was to conduct a ‘Cover Crop Farm Tour,’ to take farmers around to the different farms where Watershed Council funds were used for cover crop installation, to see what has been done and share learnings from the experiences of different farmers working with cover crops in their farm rotation. There was a lively discussion about how the group would award the funds granted from DATCP for cover crop installation in the watershed. The group debated the merits of targeting the funds toward producers in the watershed who are not currently using cover crops versus providing the funds to members who had been regularly attending meetings of the group. The decision was to make a list of interested farmers with numbers of acres they plan to install. Members who have been attending meetings would receive first priority, but the group anticipates that there will likely be more funds than current members of the group will request, and hope that others will reach out if they are interested in participating. To express interest, contact Berent Froiland at 608-391-0570 or froilandb@gmail.com. If interested, farmers are urged to communicate with Froiland before the next meeting of the group on April 23, or to attend the meeting. The group is targeting a total of 500 acres at $15 per acre. 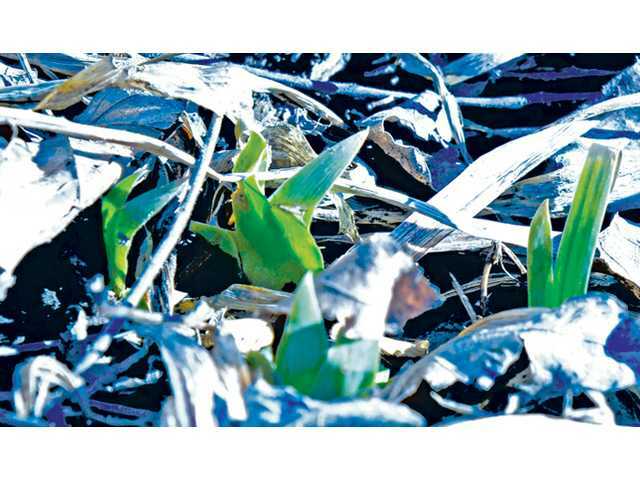 The funds cannot be used to rent equipment, but can be used to buy seed or pay part of the cost of participation in Crawford County’s aerial cover crop planting program. The cost of participation in Crawford County’s aerial cover crop planting program is about $30 per acre plus the cost of seed. The Vernon County Conservationist reminded meeting participants that it is also not too late to sign up for NRCS EQIP funding for installation of cover crops in fall of 2018. If a Vernon County farmer wants to participate in Crawford County’s program, they will simply stipulate an assignment of payment to go to Crawford County. Applications are due to local USDA Service Centers by May 18, 2018. The EQIP Soil Health Initiative provides a systems approach for conservation that is essential for a healthy soil environment. Producers can build their soil’s health through signing up for the initiative to implement the following practices: (1) crop rotations, (2) cover crops, (3) residue management no-till/strip till, (4) nutrient management, and/or (5) integrated pest manage-ment. To apply for EQIP funding, reach out to either your Crawford or Vernon County USDA NRCS office: the Viroqua Service Center can be reached at (608) 637-2183; and the Prairie du Chien Service Center can be reached at 608-326-7179. For information about Crawford County’s aerial cover crop seeding program, contact Crawford County Conservationist David Troester at 608) 326-0272 or by e-mail at dtroester@crawfordcountywi.org. Matt Emslie from Valley Stewardship Network (VSN) also shared that through his group, Ted Bay is available to consult with farmers in the watershed, with VSN covering the cost. VSN also has funds available for soil testing. If the right test is selected, the results could be applicable towards application for participation in the Farmland Preservation Tax Credit program.